You’ve got to commit to yourself. Then you’ve got to step out of your comfort zone and take action in the direction you want (or think you want) to be going. You don’t have to be fearless when you step out, I assure you. All you have to do is trust yourself and take action, no matter how small, step after step after step. When you start in the direction you think you’re supposed to be going, the way that you’re actually supposed to be going (which may or may not be the same as you thought) will become clear to you. The how of getting there will also reveal itself one step after another. You likely won’t get all that information in one burst (although you may), but you’ll get it, for sure, as you take one step then another, with the how showing up to get you to the next step. Caveat for boldness to lead to magic: you have to commit, really commit, and take any escape clause out of the realm of possibility. Resources you need will come into your life to help you once you step out and take action. People with knowledge to help you or encouragement to give you. Places that make you come alive and/or the right place at the right time to propel you forward. Things like money to finance you, trinkets that make you happy/motivated, equipment to make your dream a reality, and on the list goes. Often, you won’t even have to ask aloud for what you need, and that’s when it’s real magic. Many times what you need to move you along toward your goal will arrive in your life without a whole lot of effort on your part. Ask (or even think) and it will be given, at least that’s how it’s been for me. Caveat for the magic to happen and continue happening: you must keep taking action to move forward toward the life you most want. Ideas will keep flowing into you, sometimes so fast that it can seem mind-boggling and hard to keep them all straight. Some of them will be related to move you to the next step toward your goal. Others will be brand new and take you in a direction you might never have thought you’d go. Do yourself a kindness and start writing them down. If you do that, you’ll come to find that patterns will emerge that you might not otherwise see. Those patterns will show you the way, either to finish what you’re working on or to start something new. You may not know the how/why of the ideas when they show up, but if you write them down, you’ll come to find how they fit together to move you forward. Caveat for ideas to keep flooding into you: you have to be open to letting them all come instead of getting anxious, overwhelmed, and/or scared and blocking them. You will get everything you need right when you need it to move you forward to the next step and the next and the next, all the way until you finish at the end. That will feel like magic and actually be power. Your self-confidence will grow exponentially when you step out and keep taking action. So will your comfort zone. As will your self-esteem and self-respect and self-worth, especially once you finish. You will grow as a person. You’ll come to trust yourself, and that’s the best gift, I would argue, that you could ever get in this life. You’ll open yourself up to more possibility (because you believe yourself capable) and more possibilities will flow into your life. You’ll change your entire perspective about who you are and what you are capable of and in that way, you’ll claim power over your own life. And once you do that, you’ll come to find that you really do have everything it takes to create a life you love. Caveat for power to keep bringing you all you need: you must keep believing in yourself and the vision you hold for your life and you must keep saying yes to pursuing it. see the entire world in a whole different (more positive) light. feel alive, quite possibly in a way you never have before. fill your life with meaning and purpose that might not have been there before. 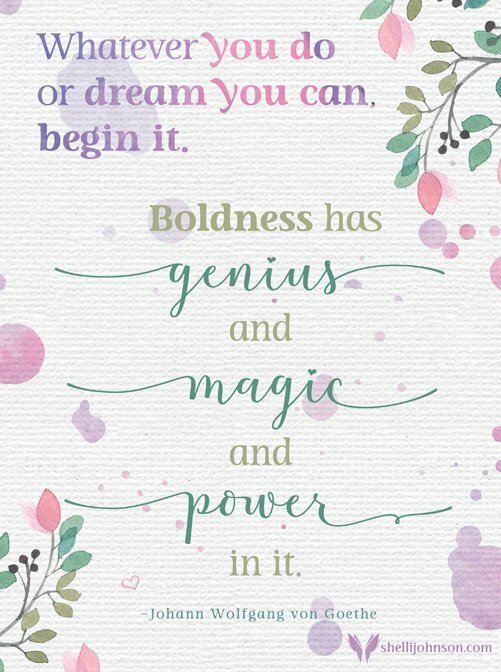 So what will you be bold about today? **If you’d like a free high-resolution version of the image above (without the logo), suitable for printing, simply join my monthly newsletter filled with motivation, inspiration, and encouragement to help you create a life you love. Just click here.